Two days after you played I'm Gonna Make You Mine, by Lou Christie, I heard it at the local supermarket. Someone is listening to you. Thanks. This most recent FH entry includes some truly great (if often overlooked) hits: from Mary Hopkin's ever charming "Goodbye" to The Clique's "Sugar On Sunday" ... The Swingin' Medallions' "Double Shot of My Baby's Love" to the Carpenters' "Sweet Sweet Smile." When I asked Karen Carpenter about the latter song (which had sadly only climbed to 44 on the Hot 100 a few months earlier in 1978), her eyes lit up as she told me with great delight how she had found the song and considered it's writer a bright new talent with a very hopeful future. That writer turned out to be Juice Newton, whose career as a hitmaker in her own right did not take off until 1981 -- two years before we lost Karen. Regarding "Sugar On Sunday," when that was a hit us DJs got a lot of calls from people who could not figure out the title of the song. I think one thing that threw them is the French term inserted into the lyrics, "Femme Jolie," which means "pretty woman." Apparently the composers preferred that phrase to "vous êtes grosse," which means "you are fat." Others in the reject pile: "Est-ce que vous êtes ivre?" ("Are you drunk?"). "Tu es completement debile" ("You're a complete moron"), "Votre grenouille a mangé mon dejeuner" ("Your frog has eaten my lunch") and "T'as une tête a faire sauter les plaques d'egouts!" ("You've got a face that would blow off manhole covers"). Play "Yellow River" on your program today ... sneak it in somewhere and see what kind of response you get. (C'mon, what have you got to lose? It's one song!!!) You have our Forgotten Hits full money back guarantee ... this is an absolute fan favorite ... and your audience will love hearing it and respond positively to it. Do this a few more times with some of our OTHER suggestions and you just might see your listeners compliment you on your expanding station's playlist. Better yet ... position your station this way ... with a formal announcement. Each day (and maybe even two or three times a day so you reach your largest listener base) you play one of our "Today's Forgotten Hit" suggestions ... and then you poll your audience. Encourage them to call, email, text ... Do You Want To See This Song Added To Our Play List? Now there's some REAL research for you ... and it's coming from the people who matter most, because now you're polling your actual current listeners ... and you're letting them know their opinion counts. If you get a positive response to a track (I dunno ... you decide ... 60% ... 75% of your responders LIKE the song ... you add it into medium rotation.) Think about that for a second ... you're going to feature five new songs each week ... and maybe one or two of them will make the cut ... so now, over the next few months you've revamped your playlist, not only adding more variety, but adding more of the songs your listeners actually want to hear!!! It's a win / win!!! And then play up the brand-new "Keep It Or Can It" feature. Every weekday at (whatever time of day you choose ... once, twice, three times? 7:20 am, 2:40 pm and 9:15 pm?) you're going to play a song "from the (xxxx) listeners' suggestion box". We're encouraging our listeners call, text and email your votes, stating whether or not you'd like to see us add this song to our play list. We're giving you more of the music that YOU want to hear! And I'm not talking mondo-obscure stuff ... I'm talking real, honest-to-God, legitimate Top 20 Hits that you're just not playing now. I have heard a Billy Joel song at least once every other day for over a week now. Even the Tonight Show played a song going to a commercial. Not to forget the Fleetwood Mac, Elton John and others on your list. You have ruined my listening habits. Every time I hear one of their songs it makes me more aware of the over played artist instead of tuning out the songs. I even have started of keeping track of how many times they play the Artist!!!! Damn you!! Now that's not to say that every time I hear a Pink Floyd song, I turn it up!. Can't get enough of Floyd! She Drives Me Out Of My Mind, although not a big national hit, was a great follow-up by the Swingin' Medallions. OK, am I dreaming, or did the version of "Love Won't Let Me Wait" played on the radio leave out the Donna Summer noises? I remember hearing it with and without, depending on the station. If so does anyone have a copy of the song without the "ahem" lady? I've been trying to find one, but no luck so far. This is beyond belief. I wrote just a little over a week ago and told about the local Clear Channel AM station that dumped their live morning guy and 60's / 70's format and went satellite country. We already have two FM country stations here. Just moments ago I'm looking at a Facebook posting that the station is 24/7 comedy. So I tuned it in and there it was ... comedy. Again, WTF?!?! Clear Channel actually thinks they can sell a comedy format in a small market easier than an oldies music format? Comedy that complies with FCC rules should be just hilarious ... imagine Louie Anderson 24/7. I'd ask what the heck is wrong with these people but everyone, including you, is trying to figure that out. Got caught in last year's blizzard and said enuf's enuf and moved to Scottsdale. We have the usual FM crud stations here but there are two AM stations that play tons of forgotten oldies. One is KAZG 1440AM (Arizona Gold) which is a real gem. Unfortunately they don't have a playlist nor do they stream but in the past 20 minutes I heard these songs plus a few "regular" oldies. Every time I listen I get at least one "Oh Wow, I haven't heard that one for a while!" At least it's nice to know there's something better out there than K-Hits or WLS, who force-feeds us in Chicago. ever thought about writing a book? your site is majestic. so anxious to see a show with ya, man. >>>Ok .. so here is a really way out question that has been bothering me for years. Maybe you can help put my mind at ease. I lived in the West Rogers Park area of Chicago - on the 3000 block of Sherwin Avenue. We moved to the suburbs in 1970 when I was age 14. I could swear that THE FLOCK lived down the block from me at the corner of SHERWIN and ALBANY. I have a vivid memory of trick or treating one Halloween and several (ahem) long haired rock star looking guys answered the door in boxer shorts. For some reason, I heard that this was the house where The Flock lived. As I muddled my way as a teenager in the early 1970's I think I 'fogged up' that area of memory in my brain. Yes! That was Ricky Canoff's house. There certainly may have been people there running around in their boxer shorts. I really enjoy reading and contributing things to your site. It makes me reflect on the great music I grew up with! It's also fun to do some research on things I'm not so clear about. If I discover that I'm not so accurate on what I have sent to you, I must immediately rectify the problem! A few months ago, we talked about that great 1963 instrumental hit by Jack Nitzche, "The Lonely Surfer". I was correct to say that David Gates, of Bread fame, DID play the bass on that track. He did lots of studio work at that time, but I was in error to say that his bass was the featured instrument, that played the melody on the recording. The lead guitar was actually an electric BARITONE guitar, performed by studio guitar ace, Bill Pittman. The 6-string guitar was made by the Danelectro Company. I believe they were the only manufacturers of the instrument at the time, and they may have even invented the electric version. The guitar had five additional frets of a standard one. Glen Campbell played the same model at the close of his hit, "Galveston". Composer, Ennio Morricone, inspired by "The Lonely Surfer", featured the instrument on all of the Spaghetti Western soundtracks he scored. Here is a demo of the guitar, that shows its low-end range. Listen all the way to the end, as the player has some fun with it. Many thanks for running the photo of Chase. And thanks to John LaPuzza for identifying the guys. My wife took a look at the photo and said "No, Jerry Collins isn't in that picture." We're still looking for Jerry, and I may contact a couple of the band members to see if they remember Jerry. FH is still the best by far! Your Jim Holvay profile tells us who wrote The Buckinghams' biggest hits ... but I want to know who wrote Back In Love Again!!? ?Also, did the Bucks actually play instruments, or were studio musicians used? Anyone see them on tour? And what is this, "Take #1" of USA Records hit? I'd like to think they were that good to record it in one Take! But, I'm guessing the Take # refers to the added horns, who the Bucks were not aware of! "Back In Love Again" has proven to be a fan favorite ... and it deserved a better fate than it got on the charts. It was written by their keyboardist Marty Grebb. The Buckinghams were clearly headed in a new, more sophisticated direction with this one but the record broke their string of five straight Top Ten Hits when it petered out at #45. This morning I woke up with a song (words and tune) in my head and I have spent the past two hours searching for it to no avail. The lyrics were The Lord's Prayer. It was a folk / pop type song in the 70's, maybe earlier. It was popular when I was a boy. I keep thinking it was "The Mamas and the Papas" or "Peter, Paul and Mary" but I can't find anything with those two groups. I have done a search with Our Father and Lord's Prayer but the title must not match the song that easily. Re: Three Coins In The Fountain (1954): I'd like to know when this stereo rendition was recorded. I found nothing on the internet. I compared it to the "original" by the Four Aces, on a Decca Records 78 RPM record, on YouTube, it's close, but not quite, but not a shabby remake! IF YOU LISTEN TO HANK WILLIAMS' "MOVE IT ON OVER", IT'S A DIRECT STEAL FROM THE HANK WILLIAMS SONG. THE WRITERS AND PUBLISHERS SHOULD BE SUED. I have an opportunity to purchase 10,000 MINT (I've seen them so I know they are) WLS surveys from 1961 - 1969. You can contact privately some of your readers if they'd like some or throw it open to the whole group, or you can say thanks but no thanks. I leave it to your discretion. You may give out my email. The timeless classic has never really been off the radio ... hits like the Barry Gibb-penned / Frankie Valli sung title track, the Olivia Newton-John / John Travolta duets "You're The One That I Want" and "Summer Nights" (along with Livy's "Hopelessly Devoted To You") come on nearly daily ... and my guess is it'll only get worse once this special edition of "Glee" airs. (Honestly, I really do love all of this music ... they did a GREAT job of updating the original stage classic by adding these contemporary ... circa 1978 ... tunes.) "Glee" airs Thursday on Fox ... check it out! Well, I gave a listen to the Yesterday Once More clip and in many ways she really has that sound down. Her grasp of Karen's singing style or mannerisms, and I mean that with the most respect possible since I'm a Carpenters freak, is amazing. She doesn't have the energy in her voice or the pitch control that Karen had, however, and those are two of the things that can really make a difference. Yes, she can do it very well on the surface, but that warmth that Ms. Carpenter had just isn't there. I listened to a few clips in a row and those were my thoughts. I would suspect, though, that she's got a heck of an ear, so who knows. How does Paige feel about her father managing The Saxonettes? What about "Lollipop" followed by "My Boy Lollipop?" next book. Two less sales on a nationwide best seller ... hit him where it hurts ... in his pocketbook! Not exactly managing The Saxonettes yet ... but I DID make the suggestion that they learn The Drifters' doo-wop version of "White Christmas" and perform it at this year's Holiday Concert. (They're taking it under advisement ... whatever THAT means!!!) Now I'm hearing that they may, in fact, work up another doo-wop medley ... this time featuring "Santa Baby", "White Christmas" and the Mariah Carey Christmas classic, "All I Want For Christmas Is You". "Radio One recreated the sound of 1960s Top 40 radio and played oldies with an echo chamber reverb effect behind the announcer much like WABC had done".Heard one station, last night, at 6000 kHz, 49 meter band, mentioning other pirate radio broadcasts!! Pretty cool! Earlier this year Joel Whitburn set the music world on its ear when it released "Hit Records", the complete chart recap of the Music Vendor and Record World charts, 1954 - 1982. Now ... just announced ... and coming out before the end of the year ... is the companion piece, "#101 - #150 - Hit Records, 1959 - 1982". Joel promises 4500 additional titles not seen in any of his other Record Research Pop Books, including "bubbling under" hits by Aerosmith, Elton John, Pink Floyd, The Beach Boys, Bob Dylan, The Who, Chuck Berry, Herman's Hermits, Rick Nelson, Johnny Rivers, and many, many more. While Billboard Magazine ran a "Bubbling Under" chart, sometimes listing as many as 20 additional "coming up" titles, Record World had the deepest chart of them all, showing fifty additional positions every week. And ALL of those titles have now been collected here ... songs that never broke The Top 100 ... TONS of regional hits, surf and hot rod music, garage rock, doo-wop and obscurities that are sure to send collectors scampering to add these titles to their collections. 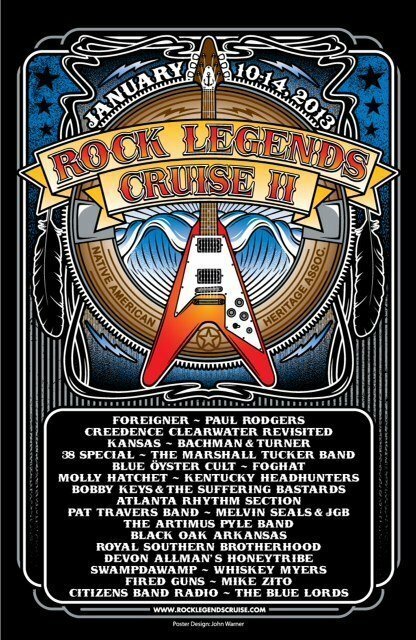 Twenty five artists will soon be boarding Rock Legends Cruise II on January 10, 2013, for what promises to be the biggest and best music festival at sea to date! With over 75 Top 40 hits to choose from, the artists (see poster for complete line-up) will be performing a vast selection of those songs along with other music gems during the four day excursion aboard Royal Caribbean's Liberty of the Seas. Artists appearing on the first night alone include Blue Oyster Cult, .38 Special, Bachman & Turner, Molly Hatchet, Foreigner, Bobby Keys & The Suffering Bastards and the Pat Travers Band. And if you're up by the crack of noon on Friday, you'll arise just in time for the sounds of the Atlanta Rhythm Section, who will lead off three full days and nights of ultimate classic rock on three separate stages. 69 live performances are scheduled! Only three "vacation days" are necessary as Rock Legends Cruise II departs Fort Lauderdale, Florida on a Thursday evening (January 10) and returns the following Monday morning (January 14, 2013). Oh yeah ... did we mention the expected 80+ degree weather in Labadee, Haiti on Saturday? Don't be left at the dock ... it's time to rock! Pricing currently begins at $699.00 per person (party of four in the same Interior cabin), with many cabin levels still available. The Native American Heritage Association has been working on reservations in South Dakota for more than 18 years and is a 4-star charity with www.charitynavigator.org for a total of eight years. Native American Heritage Association tractor trailers are on the road daily with supplies to the various far flung communities and 94% of the organization's total revenue goes towards program services which provide basic life necessities, including fuel assistance and medical transportation to 90,000 people. Many of these residents face an 80% rate of unemployment; 70% don't have transportation and many of those who do, don't have the means to purchase gas. These Lakota Sioux live in abandoned school buses, shacks or government housing with no insulation, some live without indoor plumbing, in homes with dirt floors, no beds or furniture. More information can be found at: www.naha-inc.org. By the way, if you're seriously considering taking this cruise and would like to see a schedule of the complete performances, drop me a line and I'll email you the list. In addition to the live shows, there'll also be Band Meet-And-Greets, a Rock Memorabilia Auction and a Raffle of a Custom Chopper! this week and is now listed in critical condition. McCullough experienced a heart attack Monday night, reports The Independent, saying the 69-year-old guitarist from Portstewart, Northern Ireland, is being treated at Causeway Hospital in Coleraine, Northern Ireland. I heard about this last week but never got the story posted. Henry most famously challenged Paul McCartney on the lead guitar solo to "My Love". McCartney had something specific in mind (that he had written) and asked Henry to play it. After a couple of run-throughs, Henry asked if he could "play what he feels" ... and then whipped out the solo that you hear on the #1 Hit Record today ... a total contrast to the soft, lush melody that somehow fit perfectly. Macca was impressed ... and THAT's the way the record was recorded. And, speaking of Paul McCartney, he apparently had a near-death experience earlier this year, too. Although this incident reportedly happened back in May, details just came to light this past week! Decades after Beatles fans began a rumor that “Paul Is Dead,” Paul McCartney is still alive and well. That might not have been the case, but for the quick decision making of a 55-year-old British helicopter pilot. According to a report from the UK’s Daily Mail, Paul and his wife Nancy Shevell were passengers on a helicopter traveling home to their estate in East Sussex on May 3 when bad weather nearly caused the chopper to crash into some trees. The pilot, an unidentified native of Hertfordshire, became disoriented when low clouds, poor visibility and rain forced the Sikorsky S-76C plunging downward according to The Daily Mail. The pilot reacted just in time, narrowly missing the tree line by two feet. The aircraft later landed safely at a nearby airport. The report states that Paul and Nancy had no idea they were in grave danger. PRODUCED BY GEORGE MARTIN dvd at the virtual address below.